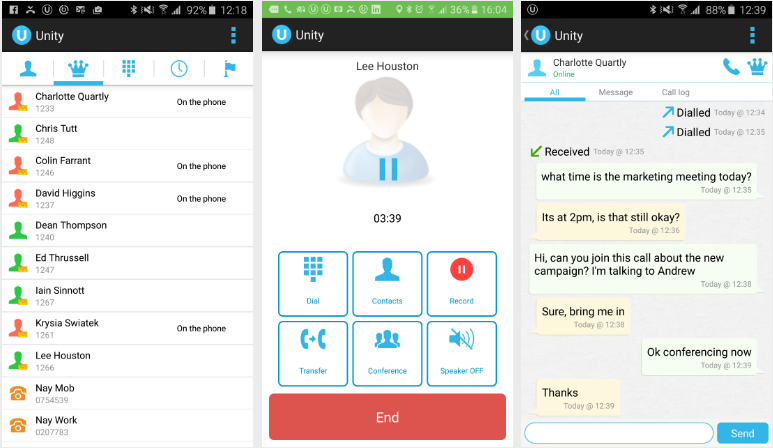 Unity Mobile for Android, iPhone and Windows extends the full BroadWorks user experience to the mobile device from as little as £1.35 per user per month RRP. With intuitive buttons for hold, transfer and conference, Unity Mobile simplifies call handling and provides a professional calling experience. Using call back and call through with the native dialler, unity Mobile masks the native mobile number without any of the reliability issues of running SIP clients. For VanillaIP partners this is a massive differentiator from other desk based Hosted PBX offerings. For customers this is a true one Number solution and also provides call recording on the mobile, which is becoming increasingly important in sectors with regulatory controls.